These are exquisite! If only I could send a dozen of the rose variety to my mother in Heaven. Then again, surely they’re already there. Enjoyed the pistachio and the cocoa-vanilla varieties just as much. These are unforgettable: my new go-to gift for the best people on here on Earth, where they still need to be ordered through Lagusta’s shop. 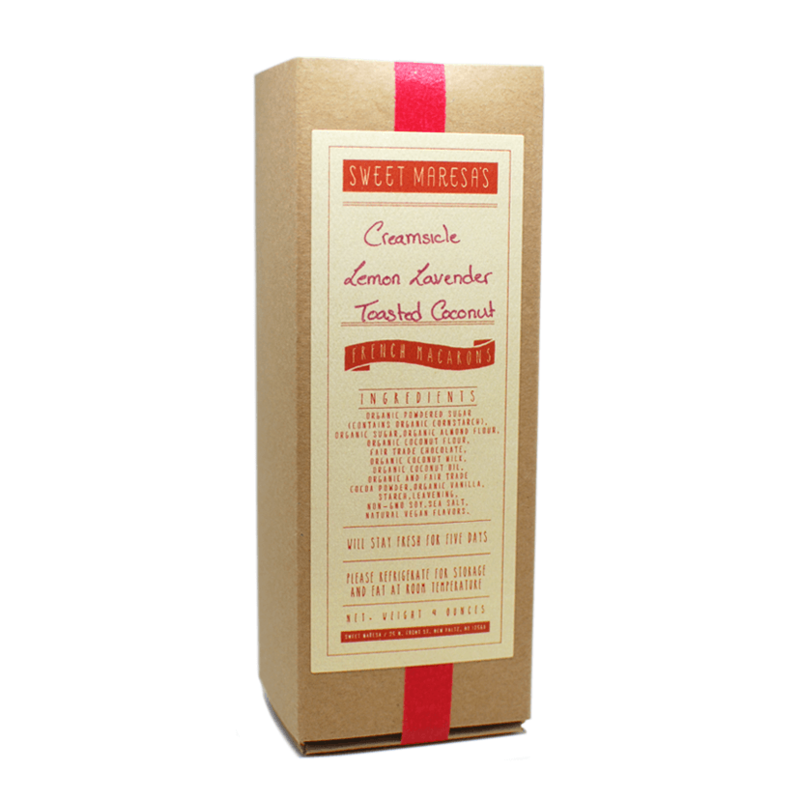 Organic powdered sugar (contains organic cornstarch), organic sugar, organic almond flour, organic coconut flour, fair trade chocolate, coconut milk, organic vanilla, starch, leavening, non-GMO gluten-free soy, sea salt, natural vegan flavors. INDIVIDUAL FLAVORINGS MAY CONTAIN: nuts, seeds, various flavorings that may include common allergens. Since 2012 we have been offering the finest macarons on the planet—that just happen to be vegan. Look ma, no eggs! After a year dedicated to recipe-developing, testing, and tasting, we are happy to offer an egg- and dairy-free, GMO-free, gluten-free version of this traditional meringue-based cookie. These macarons have a thin, delicate shell, and a soft, moist interior. 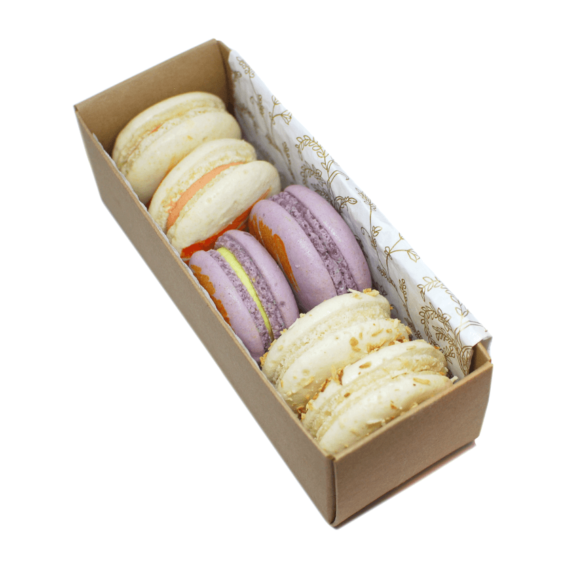 Each macaron is filled with a silky buttercream, naturally flavored to match its shell. Two each of any new flavors or old favorite. Examples of possible flavors: peanut butter churro, halvah, toasted coconut, cookie monster, s’mores, sesame matcha, almond, lemon poppyseed, apricot amaretto, peanut butter brownie, orange blossom, banana walnut, rose, chai, jasmine, darjeeling lemon, basil melon, strawberry lemonade, strawberry rhubarb, lavender, and many many more. 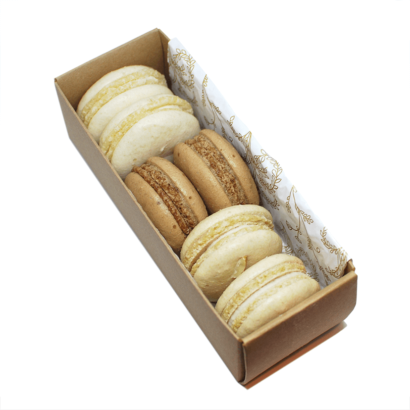 Macaron flavors are highly seasonal, so expect flavors made with local fruit and with special holiday flavors. We cannot guarantee we can include specific flavors in your box, but feel free to include information when checking out on what sort of flavors you’d prefer or would prefer to avoid in your box. For example: we cannot honor a note that lists six exact flavors you’d like to receive. We will attempt to contact the purchaser if we cannot honor a request but in many cases we will substitute flavors without informing the purchaser. If you’d like to avoid floral flavors, nuts or peanut butter (though we cannot guarantee no cross-contamination), or fruity flavors, for example, we can generally accommodate your request. For more information on macarons, check out Sweet Maresa’s on social media. Macarons are made fresh to ship and will stay fresh for five days. Please refrigerate in an airtight container for storage upon arrival and eat at room temperature. Please note that all macarons contain almond flour and a very tiny amount of soy. Macarons are made in a space that cannot be guaranteed to be free of cross-contamination from gluten, nuts, and other common allergens.